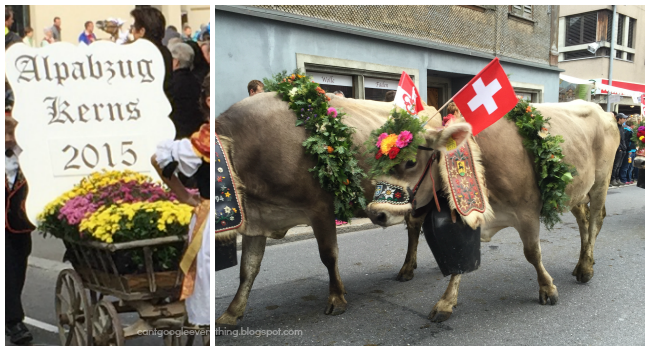 Alpine Descent: Alpabzug Kerns 2015! 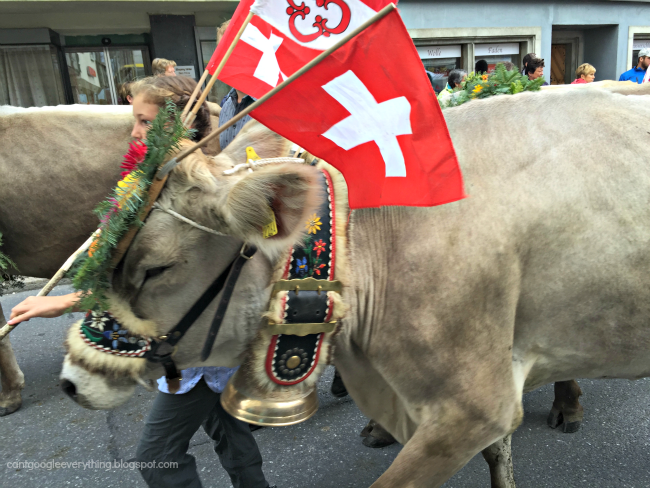 Every fall all over Switzerland you will find the traditional Alpine descent of the cows from their summer grazing grounds in the Alps to the warmer villages below! 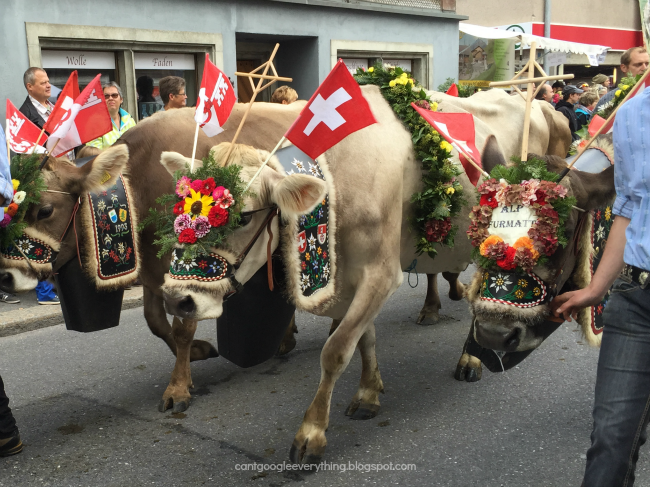 The cows get nice and dressed up with flowers and greenery for the occasion and the people get to enjoy an interesting tradition and fun festival atmosphere! 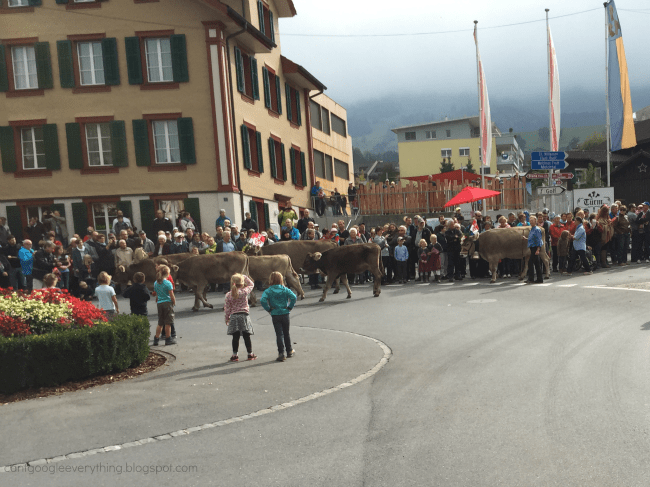 This year we drove about an hour or so to the nearby village of Kerns for the “cow parade” (not the official name,of course, just what we called it so Carter knew what we were going to do!) Here we are waiting for the cows to come home! As you can see it was quite crowded. I’m sure there is some order to which cows get more decorations and larger bells, but I am not 100% sure. It seems like the younger and smaller cows had less, so maybe its a seniority thing? 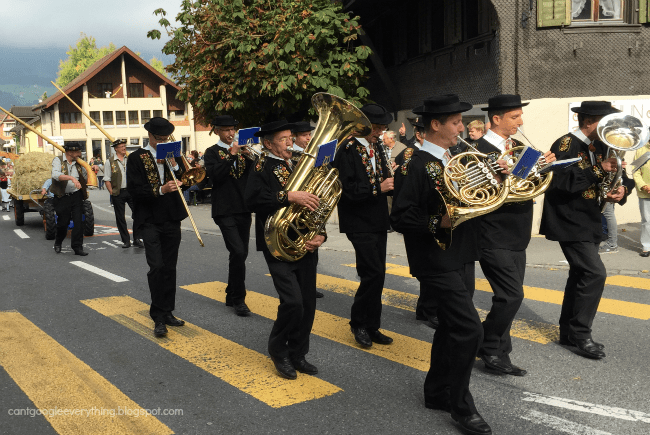 The parade also include other entertainment such as this band, yodelers and kids in traditional dress who preformed dances. 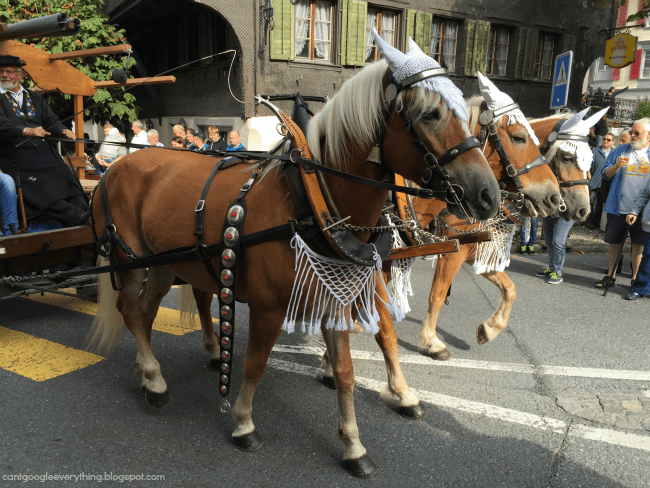 Besides the cows there were also horses pulling important people and herds of goats were included in the parade as well. And now for the main event! You wouldn’t believe the noise these bells made as the cows walked along! Many of the younger kids in the crowd were wearing ear protection, and Carter covered his ears with his hands. Moo-ve it, cows coming through! Anyways, the cows were very well behaved and all walked along the line as if they knew exactly what to do. I’m sure the farmers walking with them helped, but in the 100s of cows we saw, I only saw one go rogue! There was also plenty of food to enjoy at the event! We tried coffee with schnapps (never again! ), which was way too strong for me! We had the best grilled cheese ever- literally grilled with a huge pile of cheese and amazing! 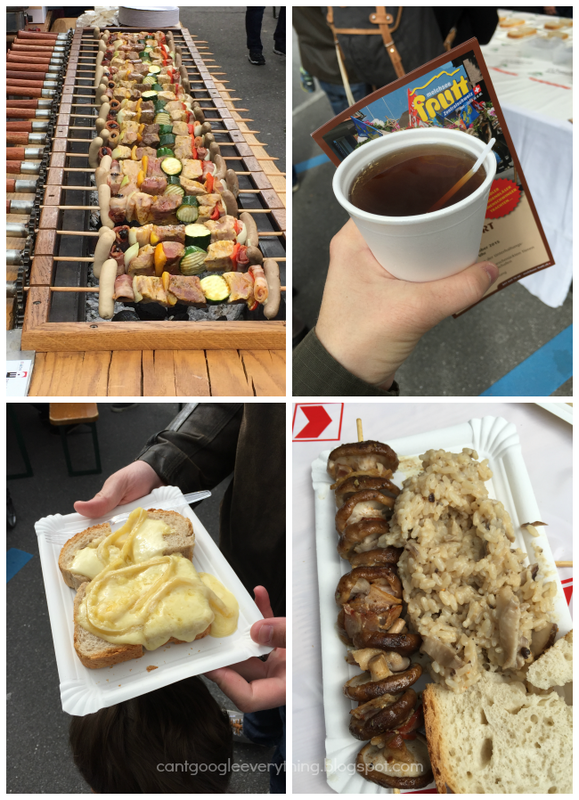 And I tried a grilled mushrooms dish which was like a mushrooms and bacon kabob and oh-so-good! 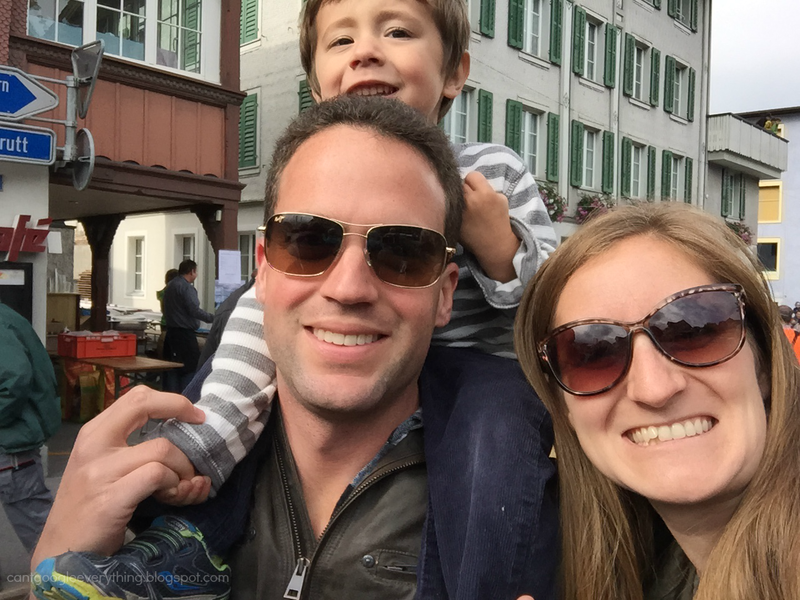 If you’re ever in Switzerland during the fall, this is something to add to your “must do” list for sure! It really is a nice event.